Your source for how to work with wood. At some point, we all need to rip a thin strip of wood for some project. Maybe you want to make some edge banding for a plywood shelf? Perhaps you need a runner for a drawer or jig? Whatever the project, there are a few tools and techniques to consider in order to cut thin strips safely on the table saw. Of all the safety tips, one of the most important is to make sure you have your splitter or riving knife installed. A thin strip of wood is much more likely to bend or flap around as it comes off the blade. A splitter or riving knife will keep that strip from connecting with the back side of the blade and kicking the board back at you. When ripping really thin strips, there is a danger that they could fall down the gap between the blade and the table saw throat plate. Not only would this ruin the piece, but it creates the potential for kickback. In this case, make sure to make and install a zero-clearance insert for your table saw. This is a handy accessory to have for a variety of tasks, so it's worth taking the time to make one now. If the pieces you need to rip are not too thin, you can do so using the table saw's rip fence, as usual. Just set the fence to the width of the strip you want to rip and run the piece through. As you get to the end of the board, make sure to have a push stick ready. If your splitter has anti-kickback pawls or some kind of guard, you'll need a push stick that is long enough to push the piece past the back of the blade while still keeping your fingers well away from danger. It may be that you cannot move the fence close enough to the blade to get the thickness you want. The anti-kickback pawls might be in the way, you don't want to risk damaging the fence, or it's not possible to make a push block thin enough to control the strip as it goes past the blade. In these situations, it makes sense to build a ripping jig. A thin ripping jig consists of two pieces: a short runner that rides in the left miter slot and a wider flatter piece with a slot cut in it and a point on the blade end. The slot allows the jig to move left and right, adjusting the width of the cut. The idea of a ripping jig is that the thin strip is cut on the left side of the blade. The majority of the board is between the fence and blade, where it is easy to control and the cut-off falls harmlessly away on the left. For the jig to work, start with a board that has has parallel edges. So, first, prepare the board as usual. With that done, place the jig in the miter slot and adjust the distance between the blade and jig to the desired thickness of the cut. Slide the jig back so that it's in front of the blade. Now, place the board on the table with one edge against the jig and slide the fence up against the other edge and lock the fence in place. Remove the jig and run the board through the saw. Re-install the jig and repeat the process: board against jig, fence against board, remove jig and cut. If you don't have a table saw or you don't feel comfortable ripping thin strips at the table saw, the band saw is a viable alternative. Using the band saw can even have a few advantages. First, it doesn't have the kickback potential of the table saw. Second, stock can be pushed or pulled through the blade safely, reducing the need for push sticks. Finally, because the blade is quite a bit thinner than that of the table saw, there's lest waste, allowing more strips to be cut from a single board. The main downside to using the band saw is that the final cut tends to be a bit rougher than that of the table saw. To account for this, cut your strips a bit wider than you need and run them through the thickness planer. This not only cleans up the rough edge, it also ensures the pieces are a consistent thickness. If you're cutting a lot of strips, joint both edges of the board, cut a strip off each edge and the re-joint each edge with the jointer set at about 1/64 inch depth of cut. With these tips, it is possible to rip thin strips safely and consistently. What do you do to cut thin strips for your projects? I like to keep my fingers firmly attached. So when I'm using power tools, I often reach for some kind of push stick or block that will keep my hands well away from the spinning bit or blade. There are several varieties of push sticks commonly used with power tools. Today I'll discuss the most useful as well as how to make them yourself. Push sticks should be considered a disposable item. While I don't go out of my way to run them through the sawblade, they do get chewed up over time. So while you can buy push sticks—and I own a few—you can save money and easily make them yourself from scrap you probably have laying around the shop. A push stick is, as the name suggests, a stick that you push some wood with. It is usually about 12 inches long and has a notch cut in one end which hooks on to the corner of a board. Push sticks are mainly useful at the table saw, such as when you're ripping thin pieces. The push stick lets you push the thin strip past the blade when the gap is too narrow for your fingers to fit safely. While push sticks come in handy from time to time, I don't like them as well as other pushing devices. By the nature of their design, they only grab a very small area at the end of the board, providing little control other than to push the board forward. As a result, I only like using push sticks in combination with other safety devices such as featherboards. Making a push stick couldn't be easier. Start with a piece of solid wood or plywood about 12 inches long, 1 inch wide and 1/2 inch thick. Though if you are ripping thinner strips, you could use 1/4 inch plywood or hardboard. Trace a curve or sand down the corners of one end for a handle so that it's comfortable in your hand. On the other end, cut a 90 degree notch that is about 45 degrees to the end, making a "V" in the end of the push stick. Drill a hole in the stick to hang it and you're done! While a push stick is useful to have, I find that I use a push "shoe" much more often than a push stick. The push shoe is much better at controlling the wood as you push it past the bit or blade. As the name implies, this is a push stick that looks a bit like a shoe. Typically 8 to 12 inches long, the push shoe has a short "heel" at the back. This heel at the end hooks over the end of the board while the majority of the shoe sits on top of the stock. This allows you to hold the wood down while you are pushing it through the machine. A push shoe also provids some measure of lateral control, helping to keep the work against the fence. Some push shoes, especially commercial versions, tend to have a "V" groove along the length of the bottom. 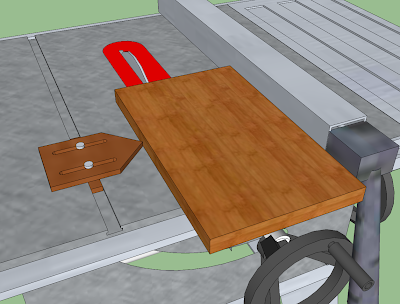 This allows the shoe to fit over the corner of a board allowing you to push down and sideways at the same time as you push the board through the machine. I find this especially useful at the router table or when edge jointing smaller pieces with the jointer. In both cases, you typically need to hold the stock firmly against the fence and the table at the same time. Having a groove in the bottom of the push shoe provides this control while keeping your fingers clear of the spinning blade. To make a push shoe, start with a blank that is about 8 to 12 inches long and 6 to 8 inches wide. Cut a long notch one of the long sides 1/4 to 1/2 inch deep, leaving a "heel" portion about 2 inches wide. You want the heel to be short enough that it won't drag on the machine table as you push the wood through. Round over the corners on the top side of the push shoe. If you want, cut a nice profile on the top of the push shoe. Cutting the push shoe in a "D" shape is common, though not necessary. A push block is a variation of a push "shoe". It is typically wider (3 to 6 inches) and may or may not have the hook at the end. Pushblocks typically have some kind of rubber or other grippy surface (e.g. sandpaper) to keep the block from slipping as you push the wood through the tool. This is especially true if the block does not have a hook at the end. Push blocks are typically used at the jointer when face jointing, but they are also useful when working with wider boards at the router table or when cutting dados at the table saw. Sometimes push blocks will have a hook on the edge, allowing you to catch the end of a board when pushing it through the tool. This can be useful at the jointer. I typically use the two different styles of block when face jointing. The front block allows me to hold the work down and pushes using friction alone. 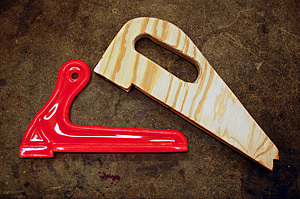 The rear push block has a hook on the end to make it easier to push the wood over the cutterhead. A push block starts with a piece of wood about 4 inches wide, 6 inches long and 1 to 2 inches thick. A cutoff from a 2 by 4 makes a good blank for a push block. Drill a hole in the block and glue in a dowel to use as a handle. If you like, you can angle the hole to provide a more comfortable grip on the handle. To add a hook on the end, cut a piece of hardboard or plywood about the same size as the end of the block. Drill a couple of holes and screw it to the end of the block. If you make the holes oversize or make them slots instead, you will be able to push the hook up and use the block with or without the hook. To finish off the block, glue a piece of sandpaper or some kind of rubber material (old mouse pads work well) to the bottom of the block. These are the push blocks that I use around my shop. Hopefully this will help you make your own and keep your hands and fingers out of harms way! Is there a style of push block that you like to use? Look out SawStop, you've got some competition on the way! A woodworker and inventor by the name of David Butler recently launched a website to demonstrate his new table saw safety device, the Whirlwind, in order to convince one or more manufacturers to incorporate the device into their saws. The Whirlwind is a flesh-sensing technology built into the blade guard which shuts off the saw within one-eighth of a second, well before the your hand can come in contact with the blade. The technology is still patent-pending (though they expect the patent to be issued soon) and there is not a product available to buy yet. Therefore, details are still somewhat sketchy about how the Whirlwind works. However, after watching the various videos on the Whirlwind website, it appears that the idea is to incorporate sensors into the blade guard. If your hand strays too close to the blade, the system shuts down the saw and stops the blade before you have a chance to contact the blade. The blade is not damaged when the safety mechanism is triggered, allowing you to continue working right away. 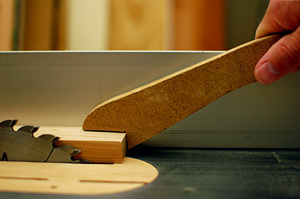 Supports saws with a standard American splitter as well as those with a European-style riving knife. Because the technology is built into the blade guard, there will be times when you aren't protected by the system. Some examples include: using a tenoning jig, cutting box joints, or any operation involving a non-through cut on a large or tall item (Though there is a solution for things like dados). The blade doesn't stop immediately. The high speed video shows the blade rotate about 4 times before coming to a stop. If someone were pushing something through the saw quickly, it seems to me that there is still the potential (albeit a much smaller chance) for injury. Some have grumbled about the tactics SawStop has used to try and get its technology adopted my other manufacturers. Having a competing technology emerge, such as the Whirlwind, should be welcome news to SawStop's critics. Even if you are not interested in the politics surrounding the SawStop, having an alternative should help bring the price down for everyone. It will be interesting to see if any manufacturers pick up this technology and incorporate it into their saws. I'm looking forward to what other ideas will appear in the future to improve the safety of table saws. So what do you think of the Whirlwind? Do you think it's a viable alternative to the SawStop? Laser Guided Hand Saw. Really? Lasers are all the rage these days for woodworking tools. From miter saws to drill presses to levels, manufacturers have been adding lasers to all kinds of tools. Now, here's the latest: a laser guided hand saw. Yes, I'm quite serious. Sears is now selling a laser guided hand saw. A laser line is projected from the saw handle on to the wood to show where the saw will cut. Great! Now I know where the saw will cut! It doesn't matter that the saw is resting on my layout line! Do people really have that much trouble lining up their hand saw with a line on the board that they have to have a fricken laser beam on their saw? A laser line for a hand saw doesn't even guarantee a square cut, as it might on a miter saw. With a miter saw, you can make a tick mark where you want to cut, line up the laser, and be quite sure that the cut will be square (or whatever angle you set the saw to). With a hand saw, you still have to draw a layout line across the board and follow it in order to get a square cut. Now I'm not saying lasers don't have their place in woodworking. As I aluded to before, I can definitely see the value of using a laser to line up a drill bit or miter saw blade with a mark (though I, personally, don't have any tools with this feature...yet). Once the tool hits the wood, it better be spot on, as there's no going back. With a hand saw, the process is slower and it is easier to correct a mis-aligned cut as you go. Maybe I'm becoming old fashioned, but a laser guided hand saw falls firmly in the "gimmick" camp for me. What do you think? Have you used this saw? Did you find the laser helpful? This past weekend, Popular Woodworking Magazine is reporting that Delta Machinery, owned by Stanley Black & Decker, is being sold to the Taiwanese company, TOTY. As part of the sale, the company is being renamed to Delta Power Equipment. If you've been doing woodworking for any period of time, you've likely heard of Delta Machinery. Founded in 1919, Delta has been producing woodworking equipment for over 90 years. Many people probably know the company as one of the main sponsors of The New Yankee Workshop, where their popular Unisaw was at the center of the workshop and used in most every episode. While nothing will likely change in the short term, I look forward to seeing what this means for the company in the future. What do you think of the sale of Delta? Woodworking is potentially dangerous. Make sure to understand and follow all the safety instructions provided with your power tools. Above all, remember to wear your safety glasses! Copyright © David Hay. Powered by Blogger.